100% of Sales Donated Equally to Display Charities Red Nose, Cure Brain Cancer Foundation and Humpty Dumpty Foundation. 100% Organic made with premium Coconut and Soy Wax - Natural Wick, Hand Made, Jars can be re used. 40 hours of burn time, can be used as a Candle or Room Scent. 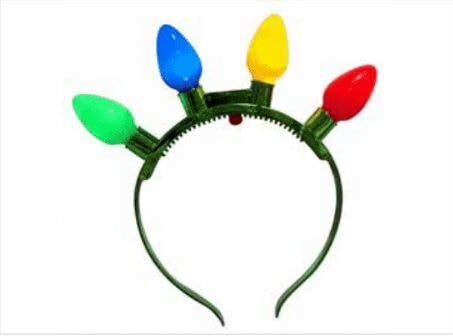 Get the holidays started on a fun note with this light-up headband. Plastic band with 4 nostalgic, oversized light bulbs that flash. Change functions by repeatedly pressing the power button. Perfect accessory for holiday parties! Good news this item is back, we have had similar variations of this for the past 4 years and it has always sold out every year despite us ordering more every year so get in quick to avoid missing out. These Deluxe Christmas (Santa, Tree, Snowman) Wands with Spinning Lights is a dazzling spectacle of lights, encased in a colorful Christmas shell. So fun at nighttime Christmas parades & exciting for kids to find in their stocking on Christmas morning. Make no mistake this item is a Christmas hit! Did you miss out on this at Vivid 2018? if you did it was probably because 20,000 were sold and none were left until now. Old and young alike love the flower crowns. "They look like halos", commented one happy buyer, whilst another observed "It makes the crowd look magical. They're also an excellent Christmas gift for your favorite angel, or an elegant touch to your table decor. You will be able to purchase Merchandise onsite at the display at the Merchandise Stand or if you come on a night the Merchandise Stand is not set up due to the weather or another reason you may request and purchase it or you can email us at cambagelights@gmail.com and reserve your items and we will hold them until you can collect them.